Experienced Technicians - B & M Air and Heating Inc provides trained and qualified technicians for every job and every customer. Trust the pros when your thermostat needs repairs or replacement, and trust the experience that comes with years in the business. Established in 2014, B & M Air and Heating Inc has seen thermostats and heating systems develop from traditional models through to the digital units of today. Wide Product Selection - B & M Air and Heating Inc works with the best manufacturers in the industry and provides customers with reliable thermostat models designed for a wide range of heating and cooling systems. Both residential and commercial clients trust our technicians to recommend and install only the best units, and all repairs are completed with quality parts and components. Call B & M Air and Heating Inc at (323) 402-4203 and upgrade to the latest thermostat models for greater comfort and control. Efficient and Affordable Service - B & M Air and Heating Inc technicians work hard for you. 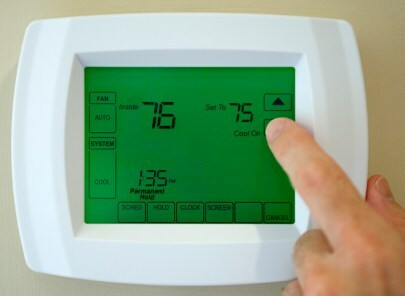 We offer thermostat repairs, replacements and initial installations at affordable, inclusive rates, providing you with cost effective and reliable heating and cooling system. Ask us about our maintenance schedules that include thermostat inspection and testing. All of B & M Air and Heating Inc’s professional services are reasonably priced to help make your home or office more comfortable. For professional and experienced technicians and a wide selection of quality thermostat models and components, trust the experts at B & M Air and Heating Inc. Call (323) 402-4203 today for details and to book an estimate on your project.